FLSmidth wanted to develop a very complex machine that could revolutionize the mining industry by reducing the costs associated with fuel, vehicle maintenance and infrastructure. FLSmidth worked with Maplesoft’s Engineering Solutions team to create a high-fidelity multi-domain model of the machine, and identify any potential problems with the system design in advance of production. Working with Maplesoft, FLSmidth designed a fully functional model of the Dual Truck Mobile Sizer (DTMS). Learning about potential problems early in the design stage allowed the project to stay on track. Knowing that the DTMS will function correctly the first time in the field will save millions of dollars in both production and redesign costs. In the mining industry, processing plants are generally constructed on the site of extraction. Mined ore gets transported by super-heavy duty trucks to the plant, where it gets crushed into smaller sizes before being stockpiled, or transported offsite for further processing. Besides the ore, the mine typically has to move four times as much overburden as ore. Big mines typically have to move 700,000 tonne of material per day. As the mine gets larger, the trucks have to travel longer distances to deposit their load, resulting in significant increases in the cost of fuel and vehicle maintenance. To address this problem, FLSmidth engaged the services of the Maplesoft Engineering Solutions team to develop design and analysis tools that would help them design a Dual Truck Mobile Sizer (DTMS) - an innovative machine that can be relocated throughout a project, as the haul distances increase. The DTMS increases in-pit crushing efficiency due to its dual-skip configuration. A truck backs into one skip until it reaches a restraining curb in the floor. After dumping its load on the skip floor, it then slowly pulls ahead, lowers its bed, and pulls away. Once the truck clears the end of the skip, the skip can be raised. As the skip is elevated, it pours material from the discharge of the skip and deposits the material into the apron feeder hopper. As material is introduced onto the apron feeder, it conveys the material to the sizer where it is crushed to the appropriate size. After being crushed, the material is deposited onto the discharge conveyor where it is taken to the bench conveyor. This process is performed while another haul truck is depositing material into the twin skip, thereby increasing the number of truck cycles. MapleSim’s modeling approach not only addresses the basic requirements of dynamic multidomain simulation, but through seamless access to the underlying symbolic equations, enables the user to rapidly create targeted design tools using Maple’s high-performance symbolic computation engine. The creation of the skip model was complemented with the development of multiple design tools to aid in adjusting the model to achieve the desired behavior. One such design tool is the Geometric Design Evaluation tool, which provides the ability to evaluate changes in the dimensions of the skip design and their effect on the dynamics of the system. The tool uses Maple, Maplesoft’s symbolic computation tool, to perform a parameter sweep, by simultaneously running simulations using the different parameter values provided. Maple then presents the results overlaid on a single plot window for easy comparison and evaluation. Other tools developed include tools for sizing the hydraulics and components, designing the motion profile, investigating the dynamic loading on the bearings, and estimating the material flow load. 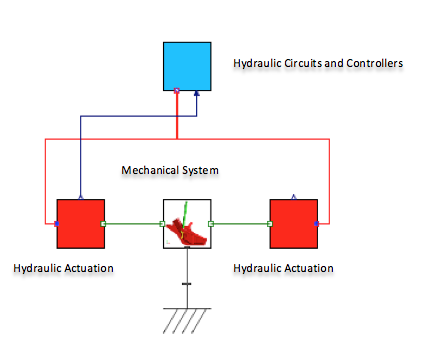 As part of developing and testing the skip model, Maplesoft’s technical team also evaluated the design, to identify the sources of vibrations and their effects. They developed an approach to perform stability analysis, which was made possible by the fact that the skip model provided easy access to key geometric features and dynamic properties of the design. The stability analysis approach was demonstrated using a case study in which the location of the feedback sensor was varied. The analysis identified a potential issue very early in the design phase, enabling engineers at FLSmidth to develop a more robust design. “The stability analysis performed by the Maplesoft team was very insightful,” said Fourie. “Knowing about a potential issue early on enabled us to design with it in mind, rather than having to go back and rework our design at a later stage. This contributed to keeping our project on track, and saved us millions of dollars down the line.” The stability analysis design approach and all the other analysis tools developed by Maplesoft were delivered to FLSmidth, enabling them to apply them to future projects. Once the modeling and testing of the skip system was completed, during the following phases of the project, Maplesoft staff went on to develop the chassis model, and finally the full DTMS. Many more design tools were created, providing the ability to evaluate joint flexibility, center of mass variations as the skip was raised and lowered, and even soil modeling to investigate the vertical displacement of the system on different types of soil.